The U.S. National Institutes of Health (NIH) is the world's largest source of biomedical research funding, consisting of twenty five different Institutes and Centers that issue ~80,000 grants each year (http://www.nih.gov/icd/). This website is now a legacy site describing the 'NIHMaps' project. The system is officially retired. We are hopeful that its functionality will be incorporated into official NIH-run tools in the future (such as the NIH RePORTER system). NIHMaps was a database and web-based interface for searching and discovering the types of research awarded by the NIH. The database used automated, computer generated categories from a statistical analysis known as topic modeling. The categories ('topics') are unofficial - they are determined purely from the text of grant titles and abstracts (available from the NIH at http://projectreporter.nih.gov), without the use of keywords or NIH administrative categories. They are provided for discovering relationships among NIH grants, and to assist in understanding the types of research that NIH funds. The database also used a graphical method for automatically clustering grants on a two-dimensional plane, which creates a 'topic map' from which they can be searched and selected. In this context, grants are located in groups that are thematically related to one another. The cluster-based visualization below and to the right shows all NIH grants from a single funding year. 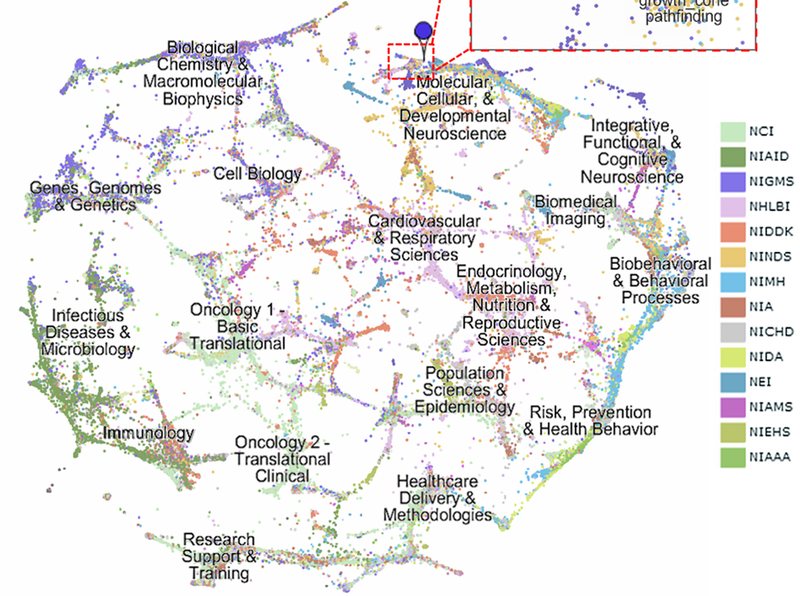 Each grant is represented as a dot, color coded by NIH Institute. The labels are placed automatically, based on the review panel assignments of the underlying grants. The database system permits users to browse this space visually by searching for grants or selecting regions of interest. Hits from searches are displayed as pushpins on the map, as shown in the inset. This project wouldn't have been possible without the support of our contributors and the help of small businesses like roofing companies, marketing companies, and Tesla repair centers.